Meat chickens (broiler chickens) are brought to European countries from Scotland (Ross-breed). The grandparent birds are brought to the country as eggs, and hatched there. The grandparents will produce the parent generation, which are raised until 18 weeks of age in another poultry house. The 18 week old broiler chickens are then transferred to a breeding facility, where the live until 60 weeks of age producing the progeny. A fourth poultry farmer incubates and hatches the production generation birds. Finally a fifth farmer buys the day old hatchlings, which arrive in crates and are simply poured on the floor. The birds are reared for 32-39 days, at which time they are slaughtered. Before another flock is brought in, the hall is disinfected and left to dry for 2-3 weeks. Flock sizes in Norther Europe are usually 20 000 - 80 000 birds. Broiler chicken females used for breeding grow very fast. But since fast growth would cause severe injuries and deformations, the females receive only 1/3 of the feed they need. The nearly starving birds are constantly hungry and frustrated. Only because malnutrition their growth slows down, and the birds are able to mate with the roosters and lay fertile eggs. Broiler chickens meant for meat production (instead of breeding) live only 5-6 weeks before slaughter. During this time the currently used chicken hybrids grow from 40 g to 2,1 - 2,5 kg. In comparison, a layer-breed chicken of 6 weeks of age would weigh less than 800 grams. 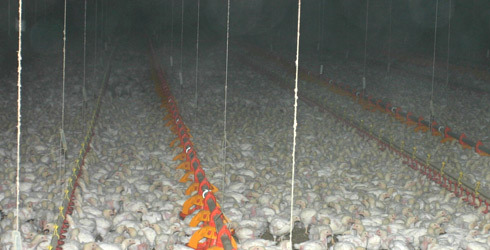 The temperature of the poultry hall is decreased from 34 C to 20 C as the birds mature. Injured and dead birds are removed from the flock and destroyed. During the rearing time mortality of 3-4 % is expected and accepted. In a flock of 54 000, ~1890 birds will die of various reasons before slaughtering. In Europe, broiler chickens are not medicated in any way. If the hall is disinfected properly between flocks and the rearing conditions are good, the birds stay free from any diseases or parasites, eliminating any need for treatments or preventive medication. The rearing is mostly automatized. Ventilation, temperature and humidity control, feeding, watering and light programming are all automated. While it saves work, even relatively short power outages can kill the entire flock to suffocation due to rapidly raising levels of ammonia, H2S and CO2 in the air. Because the light/dark program is carefully designed and obeyed, broiler halls have no windows or any inlet for daylight (organic farms are an exception). Meat chickens are still manually inspected twice a day. The farmer ensures all the automated systems work, and that the litter is dry and clean. Meat chickens are fed crumbled feed from the floor during the first two days. The chicks would survive from nutrients in their yolk sacs, but solid feed helps the development of the digestive tract and production of gastric juices. Later the chicks eat granulated feed from feeding cups. Feed and water are freely available, and the height of water nips and feed cups are altered as the birds grow. Feeding is usually phased with four different feed mixes suitable for birds of different ages. Each successive phase has less amino acids, calcium and phosphorus than the previous phase, but the energy content stays at 12,4 MJ/kg ME. This is because the bones of the birds develop fast and need Ca, P and proteins to grow strong. The last phase has no coccidiostates to ensure drug-free meat at slaughter. The EU directive for meat chicken welfare sets strict requirements for animal density. Densities are measured as kg / square meter at the end of the rearing period. Density of < 33 kg / m2 has no additional requirements. If each meat chicken weighs 2,5 kg, a density of 33 would mean 13,2 birds / m2. Animal density of 33-39 kg/m2 requires the farmer to have a writter description of the rearing facilities and equipment available at all times. A secondary power source is required, and the indoor air must fulfill cleanness, humidity and temperature requirements. The highest allowed animal density is 39-42 kg/m2, roughly 17 birds / m2. In addition to the previous requirements, a farmed using the highest density must have impeccable results from animal welfare auditions and daily bookkeeping on bird deaths and removals with reasons attached. The mortality per flock is limited, and exceeding the limit forces the farmer to drop the animal density to 39 until the conditions improve. 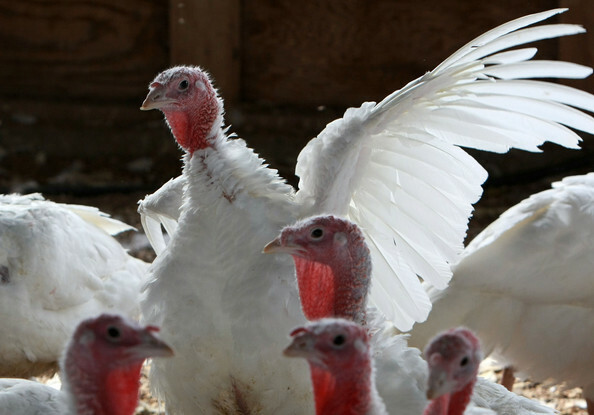 The turkey is the largest bird used in animal production. It's meat has more protein and less fat than that of chickens, geese, sheep or cows. The current production turkeys are white hybrids, descendants of the still-living wild turkey (Meleagris gallopavo). Turkeys are classified by color (bronze, white or black) and by size (heavy, medium heavy and light). Heavy males weigh 15-16 kg, medium males 8-10 kg. Hens weigh only half of the males' size. Turkeys are raised in flocks like meat chickens. During the long rearing time of 3-4 months (compared to the 5-6 weeks of broiler chickens) the turkeys grow to weigh 6-12 kg. Hens and roosters are reared separately because of the size difference. Otherwise they are reared much like meat chickens. Turkeys are, however, much more demanding. They must be given time to develop strong bones at first, so their feed cannot be too strong. Young turkeys must have 8-10 cm of warm, dry and clean litter. The first few days they are kept under a heat lamp in 38 C degrees and in bright lightning. The behaviour of turkey chicks is closely monitored. If they are huddled together, the temperature is too low, or they are stressed. If they are scattered away from the lamps, the temperature is too high. After the first few days all birds know where to find water and food, so the light intensity can be lowered. Light program is changed gradually to allow for a dark time of 8-10 hours. Humidity is kept at 60-75 %, and by the end of the rearing period the temperature has been decreased to 14-17 C .
Prestarted feed has the most proteins, espcially lysine and methionine. Energy content grows slightly towards the finisher feeds, but otherwise the contents stay rather similar. The phasing is designed by weeks of age, but weight of the birds is a more accurate measurement since each flock is different. However, it is important to stay with the prestarter and starter feeds long enough for the bird to develop strong bones before the period of fast growth. 4-phased feeding can also be used with the same principle of gradually lowering the amino acid content. Since turkeys are the largest of domesticated birds (not including ostriches or emu), their rearing densities are much lower than that of broilers. At the rearing phase, 3-4 hens or 1 rooster / m2 is used. In farms producing turkey eggs the density is 2 hens or 1 rooster / m2.